It’s the review we always welcome: AV-Comparatives conducts independent tests throughout the year to take a hard look at 21 security products for Windows, putting them through rigorous testing that examines their ability to 1) protect against real-world internet threats, 2) identify thousands of recent malicious programs, 3) provide protection without slowing down the PC, and finally, 4) remove malware that has already infected a PC. Avast was in the ring with 20 other recognized security brands and many performed notably. But look deeper, and what might not be as obvious is that Avast was competing — and scoring the highest possible marks — with a free version of our antivirus software. We’re thrilled to share the results with you. Providing our more than 400 million users worldwide the best protection is our number one priority, and we do this by continuously refining and adding new layers of protection to our security technology. 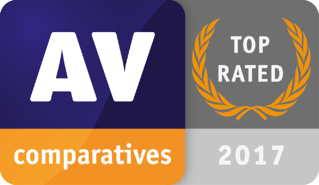 We are proud of the outstanding scores we received in AV Comparatives’ 2017 tests - this wraps up a fantastic year for us. While independent test results are useful, it ultimately comes down to how products do in the real world. Last year, we protected all of our customers from WannaCry, the biggest ransomware outbreak in history, proving that our products perform exceptionally well in the real world. In fact, in 2017 for the ten monthly Real World Protection Tests conducted by AV-Comparatives, Avast scored at 99% or higher EVERY time. It is this consistency of protection that users expect and demand. A summary of the results—and the accolades—for all the antivirus products tested throughout the year are included in the AV-Comparatives’ annual report.